On a typical work day, the sights that greet many people as they hurry thro and fro their job sites and home are usually those of beggars lined up in strategic locations scattered across the capital city, Yaounde. You see a vast arrear of beggars seated in skilfully arranged positions and pieces of clothes meant to evoke emotions that see passersby dip into their pockets, bags or whatever again and again to come out with something for the beggars’ ever present but never filled bowl. What we didn’t grow up seeing however, were sick people lying on the streets in various stages of diseases some with glucose aka drips connected to their veins. Others with band aids (plasters) covering huge parts of their bodies. Yet still others with open sore wounds with puss oozing out of it. And worst, mothers carrying very sick children with such conditions that one cannot just begin to fathom sitting on the streets and begging. Usually, they write what the child is supposed to be sick of presumably the prognosis of medical personnel. To be sure, a mother will go to lengths to do anything for her sick child. Nevertheless, each time I watch these mothers with supposed sick children from my distinct position in a township taxi either to work or home, I can’t help but wonder; is the system so deplorable and insensitive to the plight of its citizens that sick people will be left to go out of the hospital to beg for money for treatment? What happened to government hospitals and institutions put in place to carter for these vulnerable people? What happened to life before all else medical personnel swear on? What happened to the spirit of togetherness where whole communities put hands and heads together to help their own?Too many what happens. They all went down the drain caught up within the confines and growth of generation me first. Again, there is no denying the fact that the system has a lot of problems which leaves much to be desired. However, we can at one stage at least appreciate what little effort is put in place while striving for the better without blowing things out of proportion. 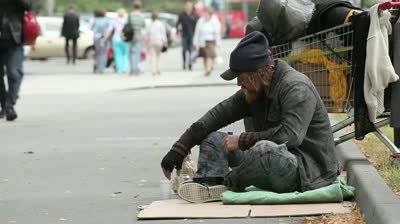 There’s no iota of doubt there are actually some really desperate individuals out there who see begging on the streets as the last resort to dealing with their problems. But there are still some things that don’t really always add up. It is always easy to say the powers that be will always turn a blind eye to what ails the society and the people they are supposed to govern, there is something many of us may fail to see, that some of these people may well be con men or women preying on the one human factor few people may ignore … our emotions. This brings me back to my topic. Desperation or exploitation? Yes my heart goes out to these people especially those who go around with very sick children and who you see nothing but utter defeat and helplessness on their faces. Many NGOs and individuals are taking this to heart and helping any way they can. Again I ask the results of a failed system? Probably so however, one can only hope these people are not preying on the emotions of honest individuals moved to help them while at the same time, hope the powers that be can be shaken out of their state of limbo as they see these desperate beggars with sick kids on the streets. Thank you Belindi Fortune please visit often and add your voice to this. conventional MLM skeptics got about the attack, together with the typical mlm negatives. post is just spectacular and that i could suppose you are knowledgeable on this subject. stay updated with drawing close post. Thank you one million and please continue the gratifying work.